This Saturday, February 13 is a Redeem to Earn Day at Canadian Tire! 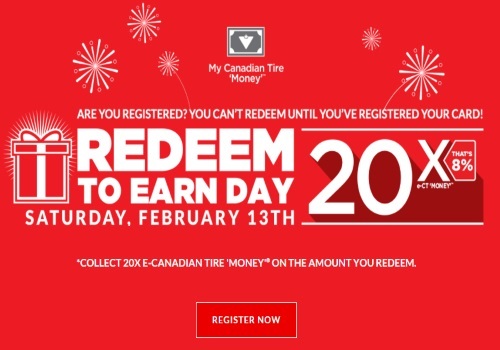 Get 20x E-Canadian Tire "Money" on the amount that you redeem! This works out to 8% for example, get $8 in E-Canadian Tire Money back when you redeem $100 of your E-Canadin Tire Money extra on this event. Please note this offer is not valid for paper Canadian Tire Money. You must have registered your e-Canadian Tire Money card before you can redeem.